“Ride-hailing” or “ride-sourcing” companies like Uber, Easy Taxi, Ola and Didi have made it much easier for passengers to get around cities everywhere, providing real-time location data, increasingly accurate arrival times, seamless payment and customized services. Goldman Sachs estimates the industry was worth $36 billion in 2017, with 15 million trips a day globally. They expect a growth to $285 billion by 2030, with 97 million trips a day. That these services are good for most customers seems undeniable, but whether they are good for cities remains unclear. One line of thought is that ride-hailing services can help reduce congestion and pollution by making it easier to not own a car and encouraging shared rides. Fewer cars means fewer emissions and less congestion, also fewer collisions, a major challenge in developing countries, which account for 9 out of 10 road-related deaths worldwide. 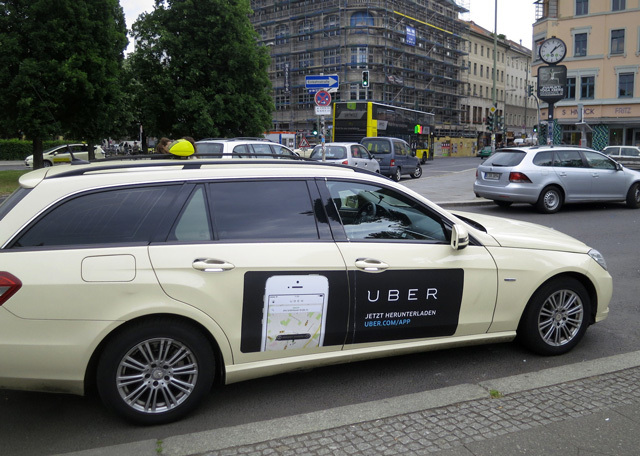 But a recent study by Regina R. Clewlow and Gouri Shankar Mishra of the University of California Davis shows that ride-hailing services might not be taking cars off the road at all. Clewlow and Mishra surveyed 4,100 people using Uber and Lyft in six large U.S. cities: Boston, Chicago, New York, Seattle, San Francisco, Los Angeles and Washington, D.C. They found most users took a car instead of taking public transit, biking or walking, and 91 percent of users still own their cars. While some users combined their trips with bus and rail, the net result was an average reduction in public transit use of 6 percent. Buses and light rail lost demand, while commuter rail saw increased ridership. The authors conjecture that for major American cities, ride-hailing has increased total vehicle kilometers – a common measure that can stand as a proxy for other related effects like congestion, emissions and road crashes. Clewlow and Mishra found that between 49 percent and 61 percent of trips would not have been made at all in the absence of a ride-hailing service or would have been made by walking, cycling or public transportation. These results are consistent with other emerging evidence, compiled in a synthesis by Andrés Gómez-Lobo and Alejandro Tirachini of the University of Chile. Alejandro Henao estimated an 85 percent increase in vehicle kilometers traveled due to ride-hailing in Denver, based on 308 trips driven and surveyed by the author himself. Another study found mixed results. Using data from the U.S. National Transit Database, Jonathan D. Hall et al. estimate that Uber reduced public transportation ridership by 5.7 percent in smaller U.S. cities but increased public transit ridership by 0.8 percent in larger cities. Other reports, not included in the list reviewed by Tirachini and Gómez-Lobo, such as those produced by a consortium of southern Los Angeles municipalities and independent consulting firm, suggest similar conclusions: ride-hailing services may increase congestion and shift travel from public transit and other modes. Uber and Lyft’s ubiquity, the large amount of data available, and interest from researchers and funders has led to many studies in the United States, but what about other contexts? Tirachini and Gomez-Lobo developed a sophisticated model in an attempt to answer that question for Santiago, Chile. In a working paper, they use a multimodal model and data from 1,600 surveys to simulate the effect of additional Uber trips on taxi, car and bus use. Under a base case scenario, with existing occupancy rates and other parameters as currently observed, the authors found the probability that ride-hailing reduces vehicle kilometers traveled in Santiago is zero. They ran 20,000 simulations and ride-hailing services never produced fewer vehicle kilometers traveled than the same simulation without them. The result is explained in part by the substitution of trips previously made by public transportation, by the addition of new trips, and, to a lesser extent, by the substitution of Uber rides for other modes of transport, like walking and cycling. Most Uber users in Chile come from taxis (41 percent) and public transportation (33 percent). About 12 percent of riders come from cars, 2 percent from walking and 1 percent from cycling. Five percent would have not have traveled at all. Higher income households substitute more from taxi and private car use while lower income households substitute more from public transportation. 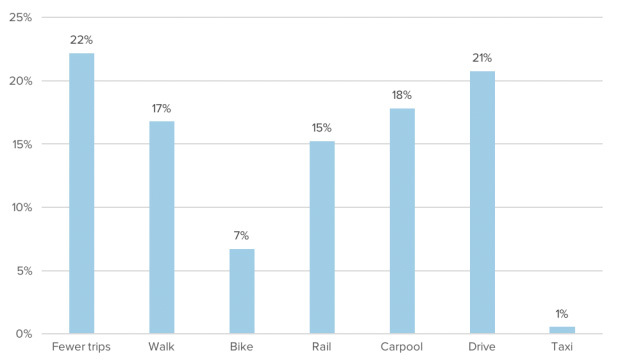 Half the public transit conversions would have ridden a bus otherwise. Tirachini and Gomez-Lobo adjusted other parameters and found there need to be at least 2.9 occupants per vehicle – up from the actual rate of 2.0 – in order to have an even shot of reducing vehicle kilometers traveled per trip. While not definitive, the conclusions of Tirachini and Gomez-Lobo provide an indication that ride-hailing may be beneficial for users but, in its current form, is not sustainable for the planet or helping to solve congestion and road safety problems. In their Santiago survey, they found the most important reasons people used Uber were the ease of payment, cost, transparency of the charging system compared to taxi-meters, and the possibility of identifying the driver and rating his/her performance. Other important motives included short wait times, lack of convenient public transportation, not wanting to drive after drinking alcohol and the perception of the service being more secure than other modes. These motives are consistent with other studies and suggest ride-sharing isn’t going away anytime soon. Making ride-hailing or ride-sourcing services effective at reducing vehicle kilometers traveled, and thus reducing emissions, congestion, and other related negative effects, may require combined approaches. Finding ways to increase the number of occupants is one way to shift the calculus. Shared services like UberPool and Lyftline grew to 20 percent of all the ride-hailed services provided by Uber and Lyft in 2016. Another is linking ride-hailing services more closely with public transit through subsidized rides to stations to encourage increased transit use, rather than replace it. Congestion charging for low occupancy vehicles is another approach, which has worked to reduce traffic in some cities. Jyot Chadha and Diego Canales contributed to this blog.